When my husband and I returned from our trip to Hawaii last year, there were specifically two meals that we said to each other that if we ever went back to Hawaii, we’d have to go back to have more of the food served at these two specific places. The first was Rainbow Drive In and their loco moco. The second was also an iconic stop for anyone heading up to Oahu’s North Shore. My husband and I were so determined to have lunch at this particular place that we told my husband’s family long in advance that we were going here no matter what, so if they were coming with us on this day, they were going to eat here regardless of whether or not they wanted to. 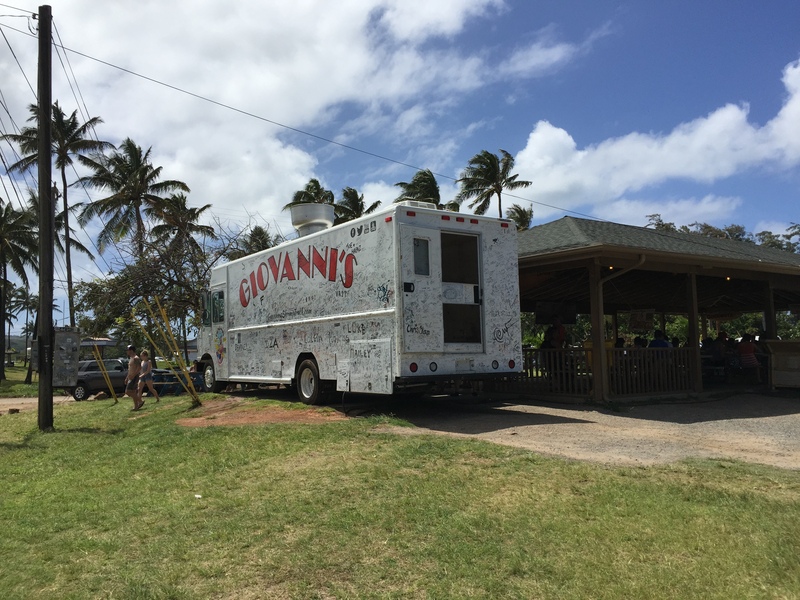 Giovanni’s Shrimp Truck was hands down the most memorable meal of our trip to Hawaii last year. The taste and flavor of the shrimp was something my husband and I just couldn’t forget. The quality, the freshness, the atmosphere of enjoying this great shrimp plate from a food truck on the North Shore of Hawaii was just quintessentially Hawaiian. 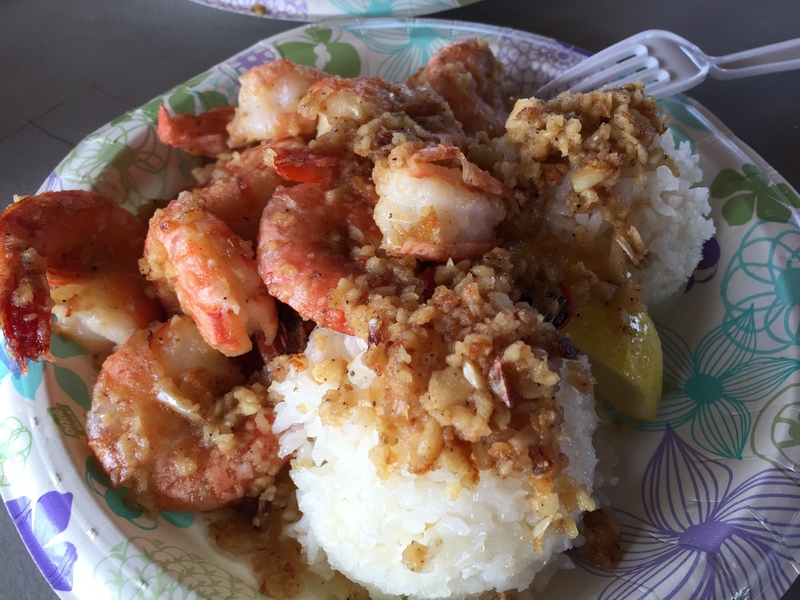 So, one of the days we were on Oahu we set off in our rental car and journeyed up to the North Shore with our destination of Giovanni’s Shrimp Truck on our radar. Last year, my husband and I shared a shrimp scampi plate and by the time we had devoured the meal we looked at each other and wondered why we had only bought one plate to share rather than each getting our own. As we drove away that day, we kicked ourselves for not having each bought our own plate. You don’t know how many times in the last year we’ve discussed how good this shrimp scampi plate was. So, when we went this year, we immediately looked at each other and said that there was no way we were going to miss out on this opportunity again, this year, we were each going to get our own plate so we wouldn’t have to share with one another. Two plates of shrimp scampi it was and by the time my husband came back to the table with a plate in each hand I think I was salivating. I couldn’t wait to get my hands on the shrimp and a spoonful of the rice with the most amazing garlic, olive oil and lemon sauce I’ve ever tasted in my mouth. I think the whole meal my husband and I said two words to each other, if that, as we immediately began tearing into our own dishes, peeling the shrimp and scooping the shrimp and spoonfuls of rice right into our mouths. There’s no time for words when your hungry and you’re presented with some of the best food you’ve ever had in your life. At that point, it’s all about how quickly you can shovel the food into your mouth. You think I’m kidding, but I’m dead serious. And of course, when in Hawaii, you wash down a dish like shrimp scampi with a can of ice cold passion orange drink. That sweet passion fruit with a hint of tang from the orange juice makes for a thirst quenching drink on a warm day with a flavor profile that compliments the somewhat sweet and garlicky flavor of the shrimp scampi drenched in lemon juice, butter and oil. 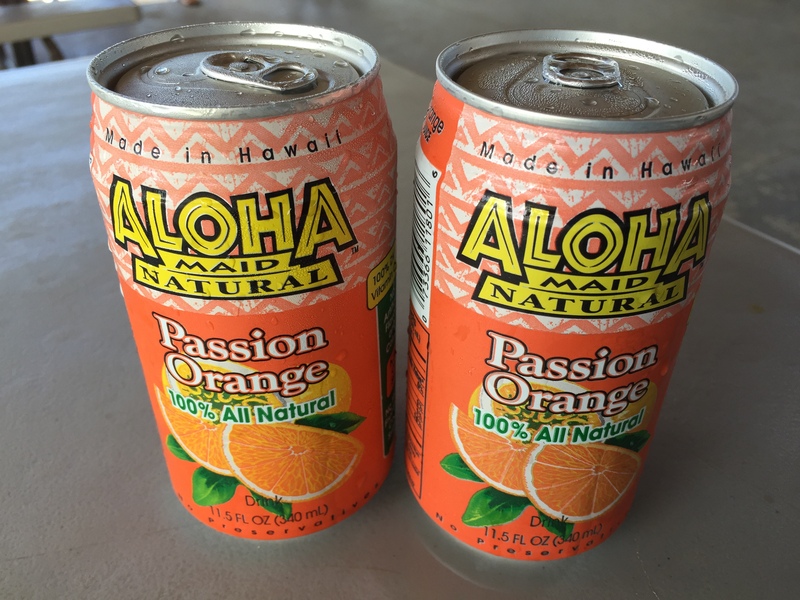 These passion fruit and lilikoi flavored sodas found on the Hawaiian islands have to be one of my favorite drinks, and in the warm, tropical weather of the Hawaiian islands, these drinks are just perfect. My husband and I each cleaned off our shrimp scampi plates. 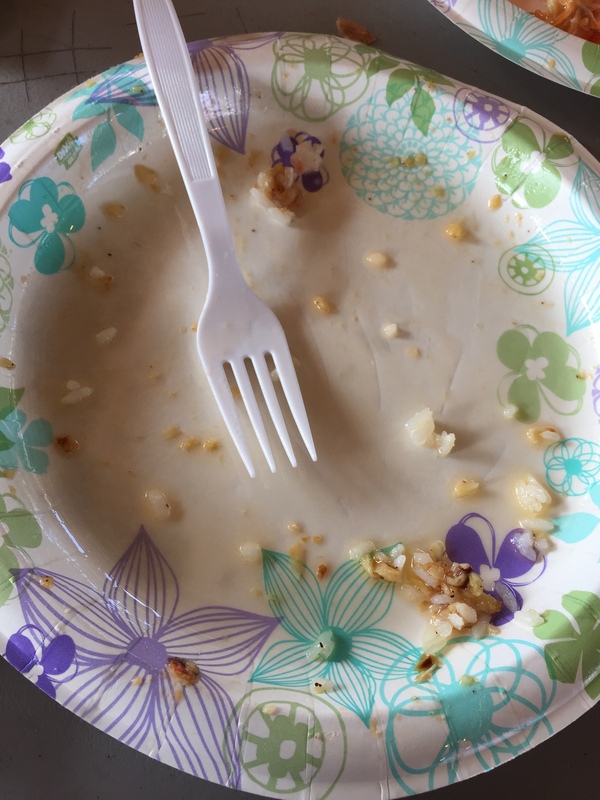 All that was left was a few grains of rice, literally. My mother-in-law also ordered the shrimp scampi plate for lunch and seemed to enjoy her dish as well. I believe my brother-in-law got himself the spicy shrimp plate, but I was so busy enjoying my own shrimp I don’t remember asking my brother-in-law what he thought about his hot & spicy shrimp plate. I think my father-in-law got a garlic hot dog, which he actually enjoyed. 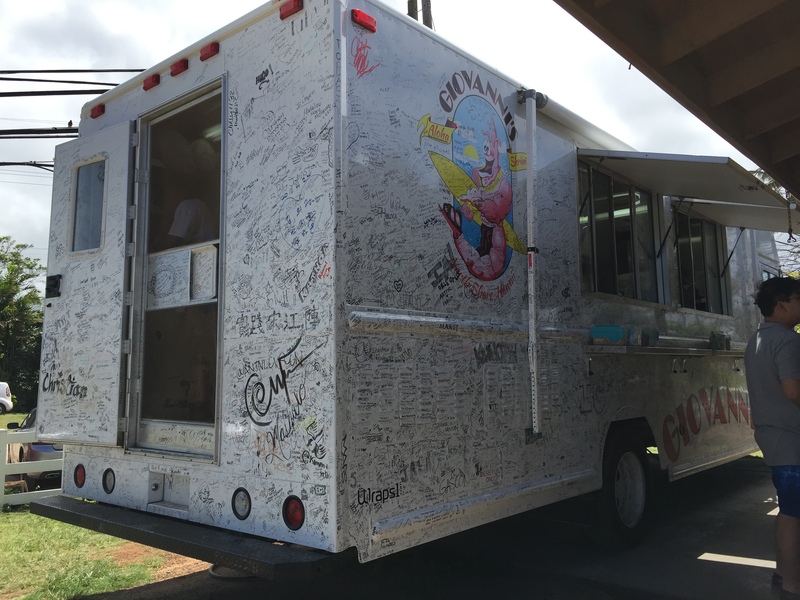 Due to the popularity of Givoanni’s Shrimp Truck and their permanent location just north of Laie, the area has turned into a little bit of a food and arts and crafts area. Giovanni’s isn’t the only vendor selling local favorites in the area as you can also buy shave ice, fresh coconuts, bbq corn and fresh cut fruit among other items. I finished off my meal by buying a small bag of fresh cut mango slices and my mother-in-law and brother-in-law both got some shave ice to cool off. My husband and I were thoroughly satisfied with our shrimp scampi meal at Giovanni’s Shrimp Truck. We had been looking forward to returning to Giovanni’s for months in anticipation to our trip to Hawaii and we couldn’t have been more satisfied with our meal. Still now, after having been to Giovanni’s twice, my husband and I still find ourselves talking about how amazing the food is and trying to recreate the shrimp scampi plate ourselves at home. It’s a good thing we don’t live on Oahu as I could see us making the trip out to the North Shore every week just enjoy Giovanni’s amazing shrimp.